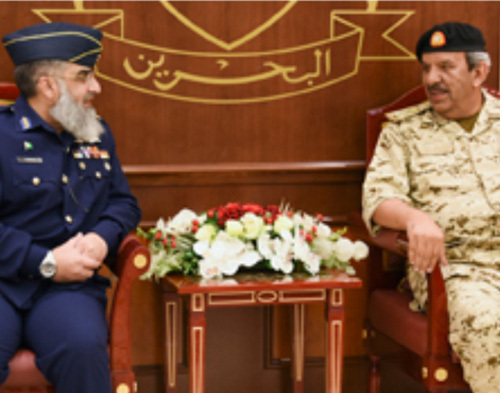 Bahrain Defense Force (BDF) Commander-in-Chief Field Marshal Sheikh Khalifa bin Ahmed Al Khalifa received in Manama last week a delegation from the National Defense University, Pakistan, led by Commodore Mohammed Saleem, and discussed joint interests. BDF Commander-in-Chief lauded the distinguished friendship relations between the two countries, Bahrain News Agency (BNA) reported. The meeting was also attended by Director of BDF Command, Major General Hassan Mohammed Saad, Inspector General Major General Abdullah Hassan Al-Nuaimi, Assistant Chief of Staff for Logistics and Supplies Rear Admiral Yusuf Ahmed Mal-Allah, Commandant of Royal Command, Staff and National Defense College, Rear Admiral Abdullah Saeed Al-Mansouri, Military Cooperation Director Read Admiral Hashim Al-Saada.